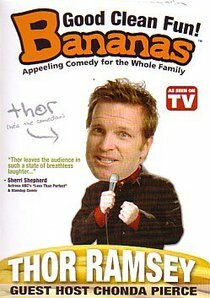 About "Bananas Featuring Thor Ramsey"
Thor Ramsey is a standup comedian and first-time author, which he is hoping to parley into a career of walking from the bed to his laptop. He is best known for the best-selling Thou Shalt Laugh DVDs and the Sony-owned comedy series Bananas, which he hosts. His first book A Comedian's Guide to Theology (Regal Books). He is grateful to everyone who supports comedy that doesn't make you feel like you stepped in something!